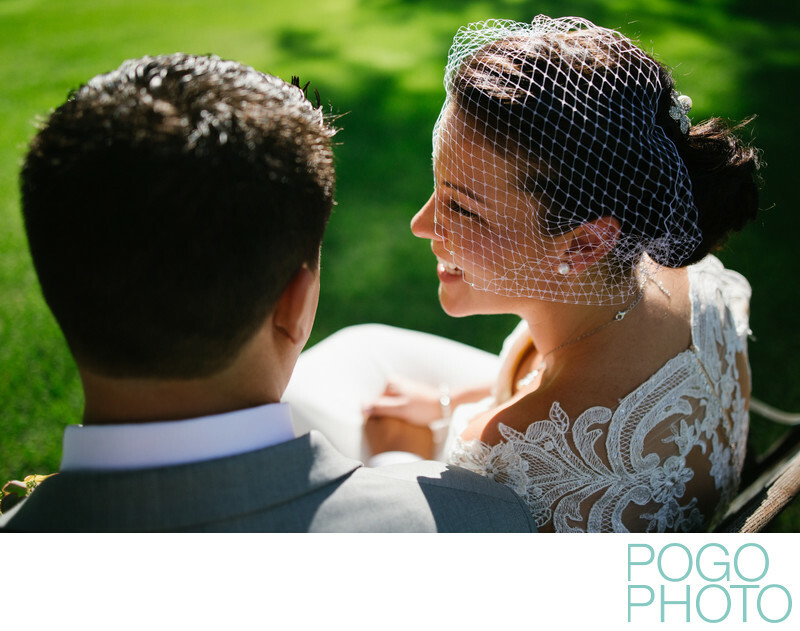 The bride’s birdcage veil in this image stands out thanks in large part to the summer sun shining brightly on their Southern Vermont wedding. Bridal veils come in all shapes and sizes and can enhance portraits immensely with the way they dance in the wind and capture the light. Lengths can range from above the shoulders to full cathedral length, but a trend from the 1940’s has come back into fashion in recent years. The birdcage veil has a classy yet playful look to it, and it eliminates the pulling aspects of some longer options. Em wore a handmade birdcage veil for our own Vermont wedding, and her handiwork is still displayed on a shelf at home with her shoes, alongside Steve’s hat and tie. Birdcage veils are almost always worn on one side of the wearer's face and the asymmetry shines during portrait time, capturing direct or indirect light. Exposing for the highlight, as we did in this shot, draws your attention to the headpiece first, then brings your eye along the line’s of the brides face. Warm, sunny days in Southern Vermont are appreciated much more than they are down south. In the our winter home in Jupiter, Florida, “warm and sunny” can describe 95% of the days throughout the course of a year. In a place that gets to experience extreme differences between seasons, people who remain in the area for a cold, dark, and snowy winter yearn for summer days like this wedding day. The term "June Bride" exists for a reason, but luckily that original reason has been replaced in the collective conscious by images of blue skies, green fields, and beaming brides. The region of Southern Vermont has long been a skiing destination, but it has become known for stunning venues and wedding opportunities. The unofficial capital of Vermont is Brattleboro, which is still one of the cutest town names we have ever heard. Londonderry, Weston, and Peru all offer opportunities to take to the slopes, while Stratton Mountain and Mount Snow dabble in marriages in addition to winter sports. One of the oldest inns operating in the United States is in Grafton, aptly called the Grafton Inn. The Manchester and Bennington regions are adjacent, and sometimes included within the area consider Southern Vermont. If venturing slightly west, we recommend seeing the Bennington Monument for a bit of localized history, and Hildene to see some American history, as it was the Lincoln Family home just one generation removed from the most famous family member. Wedding venues in the area include plenty of historic inns and mountaintop resorts. The Colonel Williams Inn and Barn in Marlboro and Bent Apple Farm in Londonderry both fit the bill for rustically styled, barn oriented events with options for indoor or outdoor ceremonies available. To go a bit higher in elevation, the Mount Snow Resort has become a hot bed for those couples viewing Southern Vermont as a reasonably close destination, just over the Massachusetts border. Southern Vermont is a great destination for all seasons, but wedding season still reigns supreme for photography studios like ours. Location: Toll Gate Garden at Okemo, 77 Okemo Ridge Rd, Ludlow, VT 05149. 1/4000; f/2.0; ISO 400; 35.0 mm.